Introducing Falqo, the next big thing on the indie-electro scene. Many of you are probably familiar with him already; his hit single “Feel Your Love” was met with thunderous applause by the electronic/nu-disco community upon its release a few weeks ago. 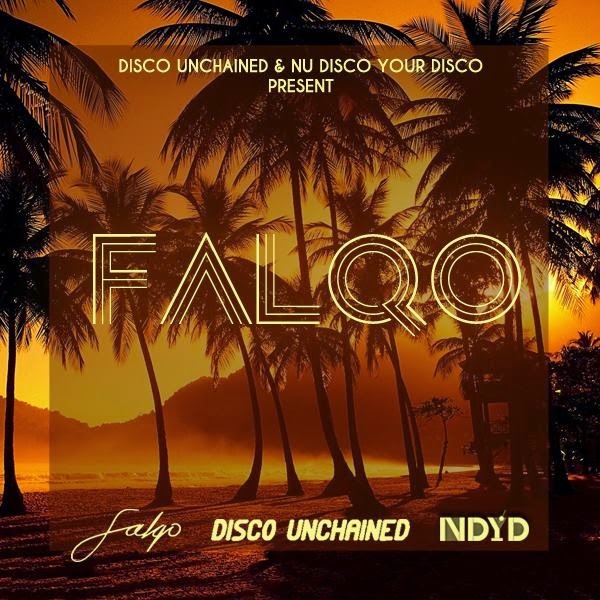 Disco Unchained’s new inter-mix program brings to you everything there is to know about Falqo. From his musical inspirations and influences, all the way to his favorite horror films, find out everything there is to know about this enigmatic artist in our exclusive debut inter-mix with him below! Also, for those of you wondering what the hell an "Inter-Mix" is; it's a Disco Unchained exclusive profile review on an artist we feel is worth taking a look at. We ask the artist questions, both personal and professional, and we explore the origins and style of their music via exclusive mix-tapes they produce specially for us. Special thanks to our friends at NuDiscoYourDisco for exclusively co-premiering it on their channels as well. Nothing but love for you guys! My full name is Alexander White and I grew up in the southern suburbs of Sydney. The name "Falqo" is derived from my favourite animal, the Peregrine Falcon. I also chose the name in admiration of DJ Falcon, French Dj/Record producer and the late Austrian singer Falco. 2) Where would you say your greatest inspirations have come from in regard to your 'sound'? My father, who's a rock-n-roll king, my mother who's a disco queen and of course, Daft Punk who have been my heroes from a very early age. I was nine years old when I first heard and saw the video for 'Around the World,' I guess that's where my love for music and film developed..
3) Aside music production, what do you do for fun? I write stories, delete emails, read books and watch way too many movies. One of my favourite stories is Braveheart, along with Avatar and Dragon - The Bruce Lee one. 4) This is tough and we're known for asking this, but what's your all-time favourite track? 5) Where do you see Falqo 2 years from now? 5 ? Ideally, I'd like to be travelling with my friends, having fun and of course, making music, but I don’t really like looking too far into the future, today is enough for me. 6) What's Falqo's favorite horror- film? 7) When is the album set to release? Any EPs or teasers in the pipe line? Working on a project at the moment, but releasing it is another story. The 'Feel Your Love' EP is set for official release in September with a music video (directed by myself.) I have a lot of other stuff in the pipeline, but can't say too much about it at this stage! 8) What can we expect from Falqo in the future? 9) Is there anything you'd like to shout-out to your fans? Falqo has specially prepared an exclusive QTAPE for us comprised of music he really resonates with. Be sure to check that out below. Special thanks to our friends at NuDiscoYourDisco for exclusively co-premiering it on their channels as well.